Blood clots are sneaky, deadly and unfortunately occur more frequently in pregnant women – especially after they have had a baby. In a non-pregnant woman, blood clots are good because they keep us from bleeding to death after we cut our finger or scrape our knees. 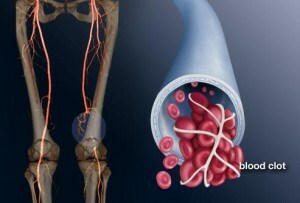 However during pregnancy, the body produces many blood clots (a condition known as hypercoaguability) which increase the risk of having a stroke, blood clots in the leg (deep venous thrombosis, aka DVT) which could travel to the lungs and cause death. Pregnant women are five times more likely to develop a blood clot than a non-pregnant woman and there is a greater chance that this will occur after the baby is born as opposed to before. Who is at risk for developing blood clots during pregnancy? A recent article in The New England Journal of Medicine had shed new light on this problem. It was known that pregnant women have an increased chance of having a blood clot for approximately six weeks after delivering a baby. However, a medical study of over 1.6 million women demonstrated that an increased risk of developing a blood clot can occur up to 12 weeks after the baby is born rather than six weeks. The greater risk for developing a blood clot occurs at approximately 3 weeks after having a baby but that risk might continue up until 12 weeks. Based on this new knowledge, post partum patients at risk for blood clots must wear compression stockings and take blood thinners for approximately 12 weeks as opposed to 6 weeks. Although you healthcare provider is aware of these new changes, you should too. Remember, a healthy pregnancy doesn’t just happen. It takes a smart mother who knows what to do.